As if driving on the other side of the road, making most every intersection a roundabout and making people driving through London pay a congestion charge wasn't enough to confuse the heck out of tourists, how about the following? You are driving south down Westferry Road in London, passing under Westferry Circus and come out to see the following in the middle of the traffic island. No, it's not a traffic control device. It's art. 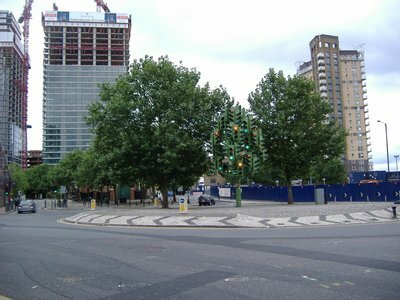 Created by Paris born artist Pierre Vivant and funded by the Public Art Commissions Agency, the piece stands in the middle of a traffic circle on the Isle of Dogs. 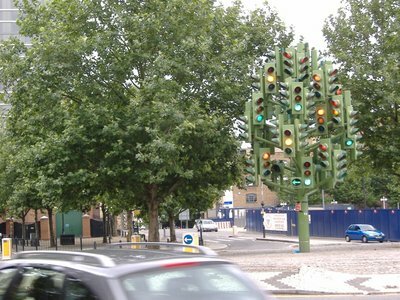 There are two trees behind the traffic light tree. They are London Planes. A third tree used to stand on the site, but died. 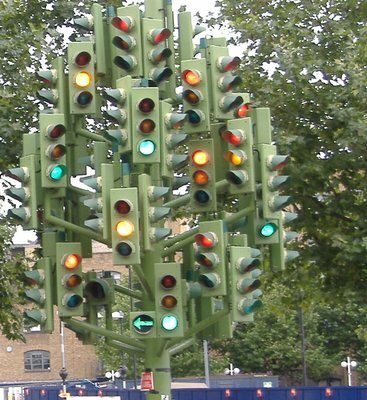 To replace the tree, Pierre Vivant's Traffic Light Tree was erected. Designed to mimic the shape of the London planes behind it, the structure has 75 traffic lights, flashing red, amber and green in a never-ending sequence. It is meant to represent the "eternal energy of the Canary Wharf area." The roundabout runs just like any roundabout without lights - cars in the circle have right of way, and those coming into the circle need to yield. But I can't help but think that it would be very confusing to any motorist approaching the circle to see all those lights.